🙂 at least she has shoes on in the picture 🙂 always a running joke in our house:) hope you’re well.. LOVED watching your wedding garden grow..might just do the flower beds like that every year! magic! Love it. Think I need to buy one for all the family!!! ahhhh the `50s – what an era – I have a cool `hug a tree` tea towel but no other NZ kitsch ones – must dig out the hot water cupboard, there must be something way down the back of those shelves ?? 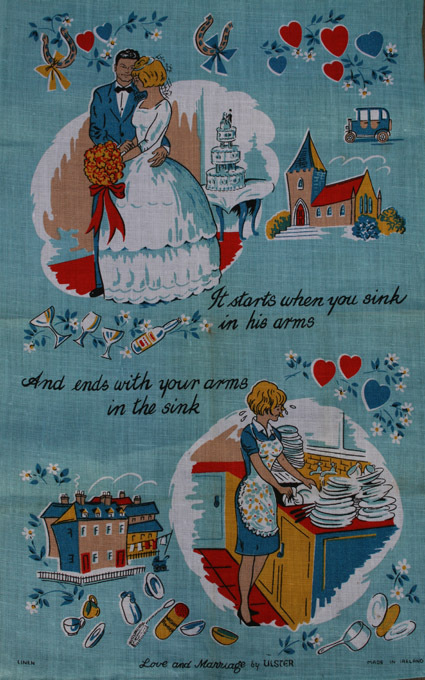 I received one of these tea towels at my kitchen tea(!) way back in 1973…..we are coming up for 37 years of marriage in May this year and we still do the dishes by hand. He does his fair share too, every day. This tea towel still makes me laugh…at times wryly.